The magnificent frigatebird is known by several names including the pirate bird, condor of the oceans and 'Man-o'-War' bird. Common throughout the tropics, this aerial acrobat can be seen across the Archipelago. 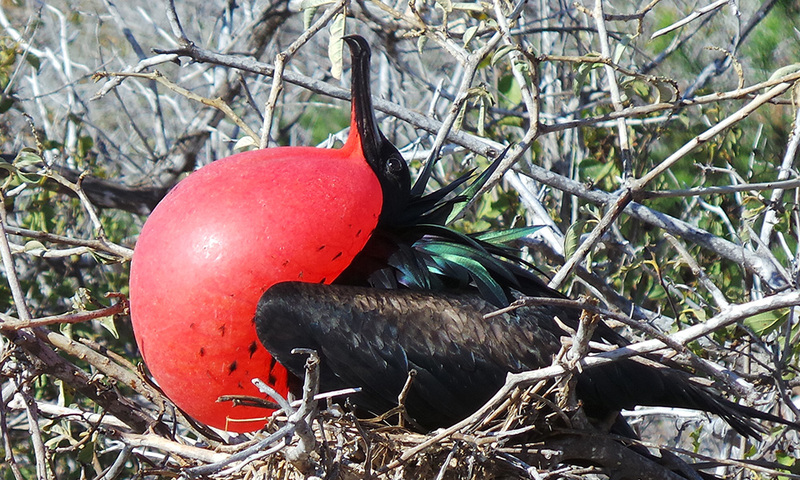 The magnificent frigatebird has several nicknames. Charles Darwin called them ‘the condor of the oceans’ because they can spend days and nights at a time on the wing and have an exceptionally large wingspan; in fact the largest wingspan to body weight ratio of any bird in the world. This body shape gives them exceptional aerial manoeuvrability and allows them to glide on thermals for days at a time. The Spanish would call them ‘pirate birds’ and ‘Man-o’-Wars’ due to their habit of stealing food from other birds. The male is all black with a purplish sheen on upper body feathers and a large red gular (throat pouch) which is inflated during the breeding season. The female is slightly larger and has a white breast and shoulder, as well as a blue eye-ring. The species is found across the tropics and it is estimated that the population in Galapagos could be several thousand pairs. Their diet includes fish and small crustaceans as well as newly-hatched green turtles. They also chase other species of birds such as tropicbirds or boobies and force them to regurgitate their recently caught food by grabbing their tail feathers and shaking them, then catching the regurgitated food before it enters the sea – hence their ‘pirate bird’ nickname. The feathers have no waterproofing and become waterlogged if they stay on the water for more than a minute or two. Almost all visitors to the Islands who take a cruise will be transfixed by the handful of frigatebirds dancing and weaving in the skies whilst following their vessel as it moves between landing spots. Breeding occurs throughout the year. During courting, a female will be surrounded by several males inflating their throat pouches and emitting a shrill trill before an acrobatic aerial display between the pair. Nests are made of a few twigs in low shrubbery close to the shore where a single egg is laid. Hatchlings are looked after for up to three months by the male after which he will breed again. The female then cares for the hatchling for a further nine months. This is the longest parental care known in the bird world. It is also the only known example of the males and females having differing breeding cycles amongst seabirds. Where to see them: Main breeding colonies are found on North Seymour, Floreana, San Cristobal and Genovesa. They can be seen throughout the Archipelago in mangroves and deciduous trees as well as foraging over coral reefs and the coast. When to see them: All year round. The breeding and nesting season varies throughout the Islands and dependent on climatic conditions. Threats: The conservation status shows that the species is not under immediate threat, however some populations globally are being put under pressure due to habitat loss and tourist encroachment on their breeding grounds. Their feeding habits also make them reliant on oceanic predators which bring their food up to the surface. 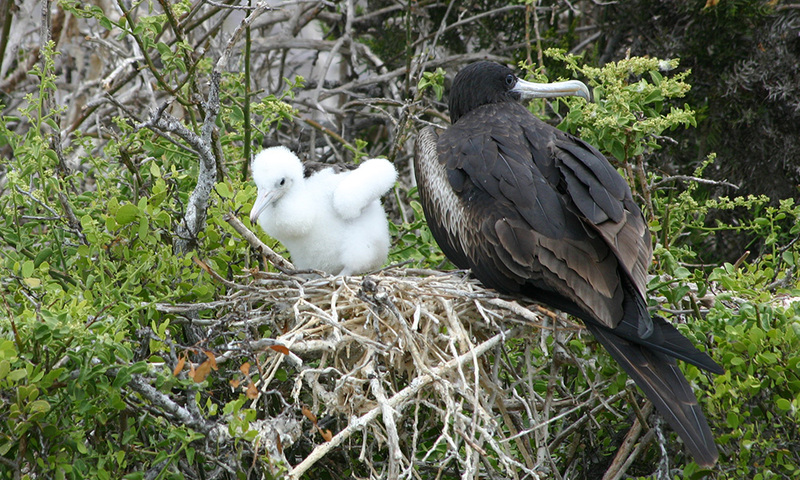 Species such as dolphin and tuna are being put under threat which in turn is a threat to the frigatebirds. They could also be affected by marine plastic pollution. 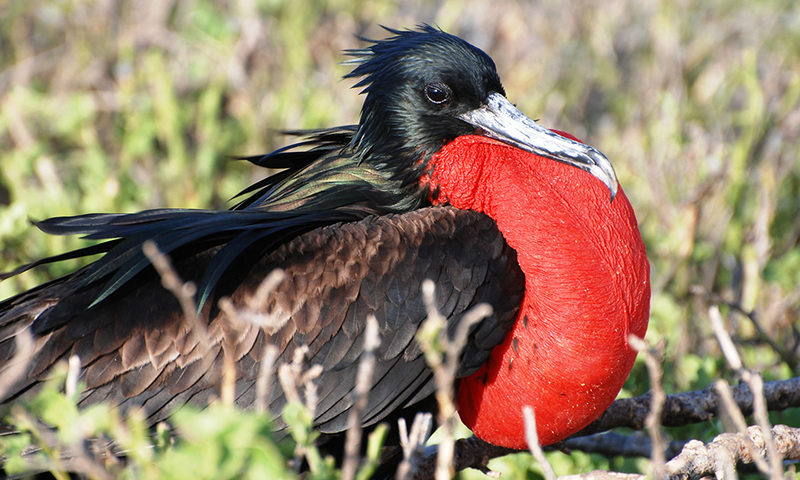 Conservation actions: The magnificent frigatebird is labelled as least concern by the IUCN Red List and as such there are no specific plans in place in Galapagos to protect this species particularly. However they are protected by the Galapagos National Park. A short video by Robert E Fuller of the courtship ritual. 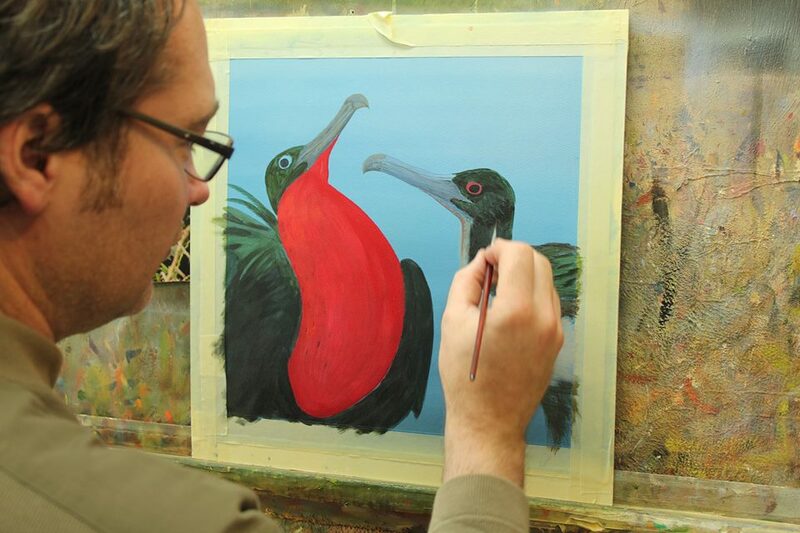 An short article by British wildlife artist Robert E Fuller about his experience of painting frigatebirds and boobies in Galapagos.